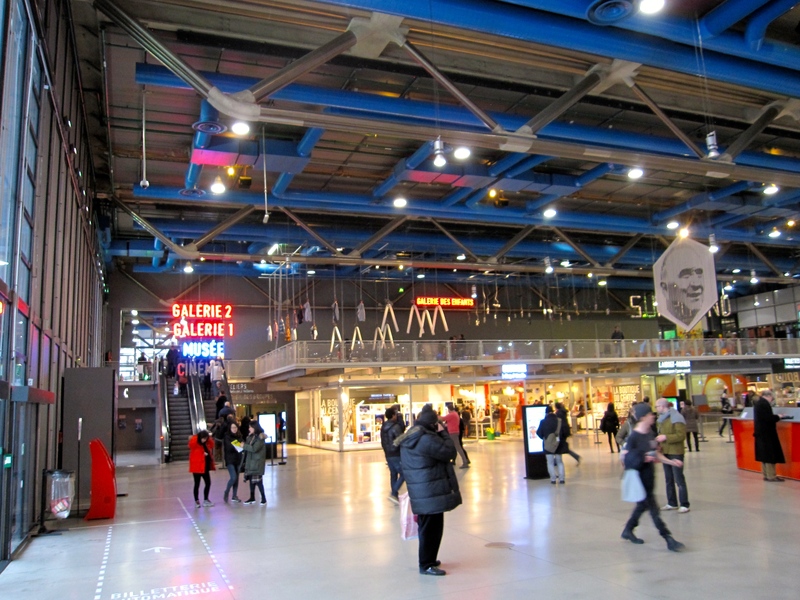 Architects Renzo Piano and Richard Rogers, inaugurated on January 31 1977. 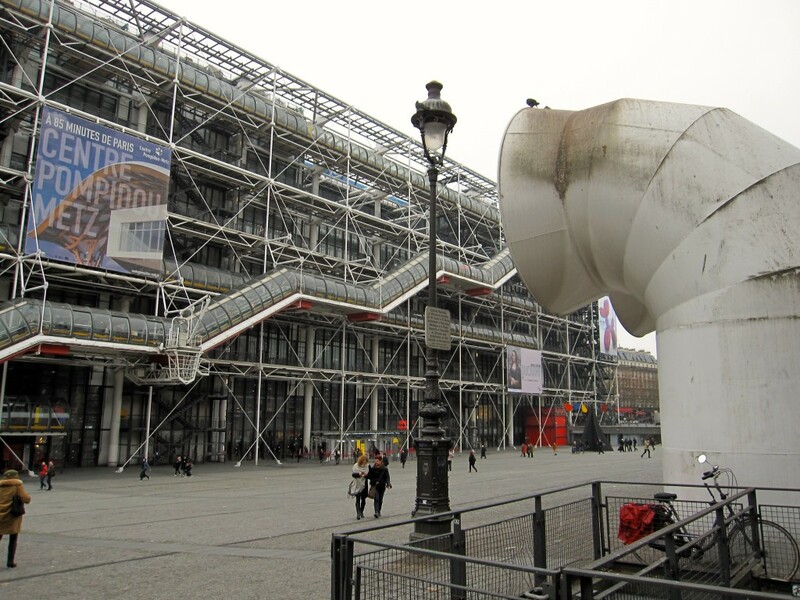 Two Americans are featured at the National Gallery for Modern Art at the Centre Pompidou in Paris currently, Architect Frank Gehry and artist Jeff Koons. I am not sure that there is any thought behind the timing of the two exhibitions as far as to have them run concurrently. The Frank Gehry exhibition is filled, as you would expect, with sketches, drawings and models of different project that he has undertaken over the years. Some are single family homes and some are developments on a bigger scale. What really seemed to capture peoples interest when I was visiting was the Jackson Pollock documentary on Gehry, Jackson Pollock often did his own videography and was talking to Frank Gehry more as a friend then an interviewer. 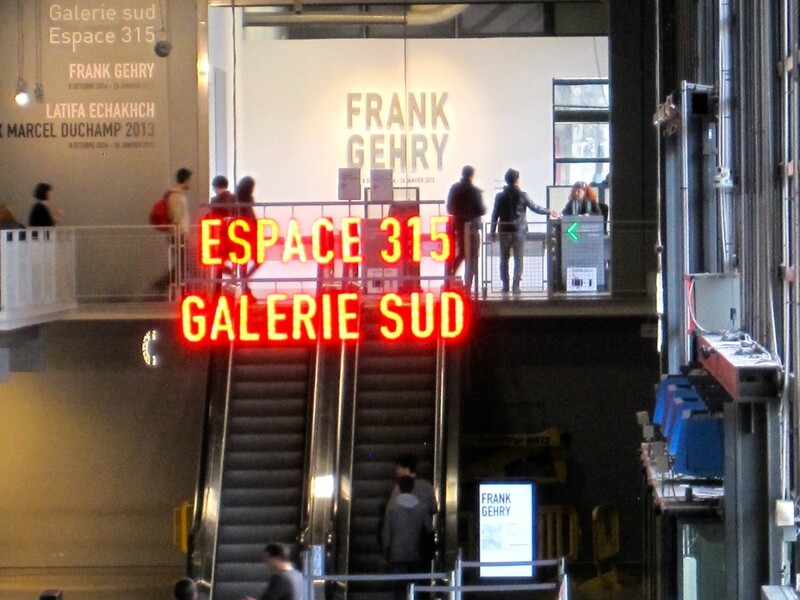 It was very interesting and gave a great insight into how Frank Gehry and his firm evolved over the years. I liked seeing the different models and especially the first conceptual crude drawings on notebook paper was very enlightening of the process involved from first ideas to actual models and drawings. Frank Gehry started out doing ‘regular’ buildings but I think he really wanted to be more of an artist than an architect and he was hanging out in artist circles more than architect circles – whatever that is. I like Frank Gehry’s buildings and they generally make a great impression on the neighborhoods they are in. I also appreciate the ‘regular’ architects that build the everyday homes we live in since we can’t all afford to live in Frank Gehry designed homes – and maybe that’s just lucky. The Jeff Koons exhibition is interesting, there is quite a few pieces that clearly makes you see how much of a narcissist he really is, not that that’s uncommon or even a bad thing for an artist to be – it might even be a requisite to ‘succeed’. He is frequently put in question as an artist by the ones that has taken it upon themselves to determine who is a ‘real’ artist and who isn’t. 2.a person who practices one of the fine arts, especially a painter or sculptor. Clearly Jeff Koons is an artist and makes art that appeals to many, and which people pay large sums of money for. I think one of the problems some people may have is his background as a Wall Street stockbroker before he became an artist. I think that like beauty, art is in the eye of the beholder – we can’t all like the same things – thank goodness for that! Many artists were put down by critics and peers at one time or another – it might even be that it just means that the art you make as an artist invokes feelings and touch people – and, see that’s just the idea with art in my book. I recall a story about Lousiana artist George Rodrigue, who went to art school in Los Angeles in the sixties and the class all went to see an Andy Warhol exhibition which their professor the next day dismissed as “nonsense’ and stated ‘he will never amount to anything’. Everyone is an artist – it just needs nourishing and to be let out – bring the arts back to the US schools! 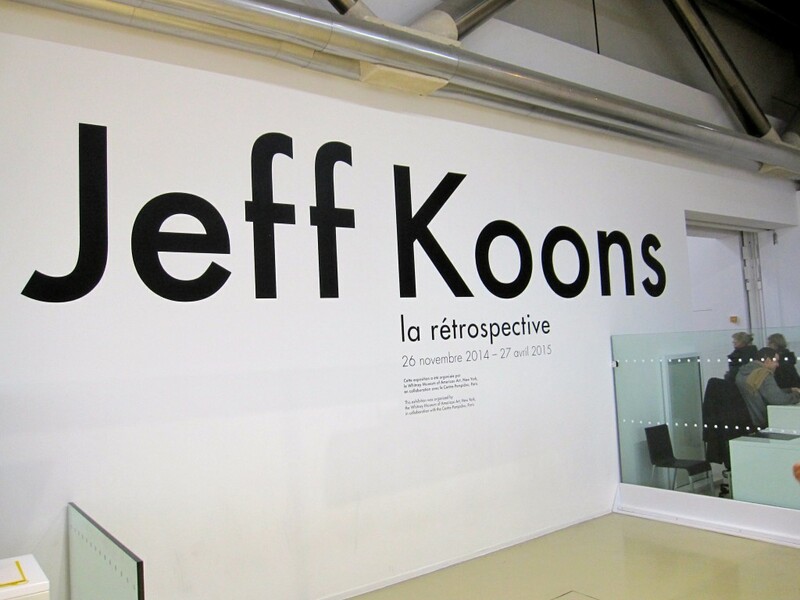 Go see the Jeff Koons exhibition if you are in Paris and be inspired and touched!